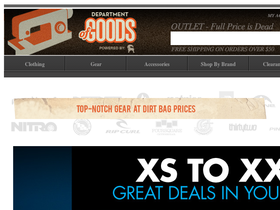 Department of Goods, online at DepartmentofGoods.com, is your destination for sporting gear at great prices. Department of Goods offers designer shirts, jackets, pants, shorts, and long underwear for men, women, and kids. Department of Goods also sells hats, gloves, shoes, socks, and swimwear. You can also find watches, ski, snowboard, biking, camping, and climbing gear and accessories as well as sunglasses, messenger bags, backpacks, shovels, goggles, and bike racks at Department of Goods. RetailSteal.com has the best Department of Goods coupon codes, Department of Goods discounts, Department of Goods coupons, and Department of Goods promo codes. Shipping and handling rates at Department of Goods depend on the pricing of your purchase and your shipping destination. Free shipping is offered for orders over $50. See website for full details, exclusions may apply. Spend $150 or more on your order from Department of Goods and use this coupon code to enjoy $20 savings. Use this coupon code on Department of Goods to get a 50% discount on everything in the store. Click to save. Use this coupon code on Department of Goods to save 40% on all items. Click to save. Spend $100 or more at Department of Goods and use this coupon code to save $10 on your order. Click to save. Save up to 85% on select clearance items at Department of Goods. Click link to shop online. Get free shipping and no tax for any order of $50 or more at DepartmentofGoods.com. Click to save. Save up to 80% on surfboard bags when shopping online at DepartmentofGoods.com. Click to shop. Save up to 75% on hiking gear at DepartmentofGoods.com. Click to shop. Buy select board shorts for men at Department of Goods and take up to 50% off your order. Click link to purchase. Head over to Department of Goods today and save 50% on biking merchandise. Save up to 30% on products by The North Face at DepartmentofGoods.com. Click to shop. Get up to 60% off during the warehouse clearance sale at Backcountry.com. Click link to shop now. Act now and take advantage of up to 30% off select Marmot apparel and accessories from Backcountry.com. Check out Backcountry.com and enjoy up to 40% off select North Face apparel. Click link to shop. Shop online at Backcountry.com and save up to 70% off a wide range of travel gear, apparel, and accessories. Shop online at Backcountry.com and enjoy free 2-day shipping on your order of $50+.